Organized by the Professional Staff Congress (PSC) chapter of the Borough of Manhattan Community college, 'Teach CUNY' is an annual effort to raise awareness of issues facing CUNY. Beginning in 2011 with an emphasis on matters relating to college budgets, the event evolved to include the topics of "inequity, affordability, and injustice at CUNY." The site includes sample lesson plans for instructors and other resources intended to promote awareness. Rights | Copyright Teach CUNY 2015 This work is licensed under a Creative Commons Attribution-NonCommercial-ShareAlike 4.0 International License. 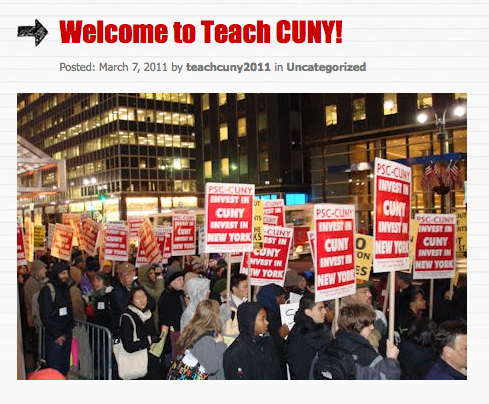 Cite This document | BMCC Chapter, Professional Staff Congress, “"Teach CUNY",” CUNY Digital History Archive, accessed April 25, 2019, http://cdha.cuny.edu/items/show/6742.